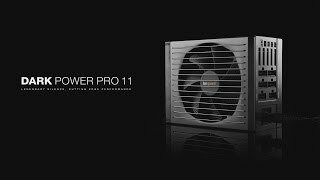 DARK POWER PRO 11 | 850W silent high-end Power supplies from be quiet! Dark Power Pro 11 850W is be quiet!’s most advanced PSU ever. With 850W of continuously available power and an overclocking key that switches between four-rail and single-rail operation, it has sufficient reserves to support any multi-GPU or multi-CPU system you could want to build. be quiet!’s virtually inaudible Silent Wings 3 fan and an unparalleled array of noise-reducing enhancements make it the quietest PSU in its category, perfect for powerful applications that nevertheless need significant quietness. And its full bridge power topology earns it one of the highest power efficiency certification available — 80 PLUS® Platinum. Dark Power Pro 11 850W is certified with 80PLUS® Platinum and an energy efficiency rating of up to 94%. This provides lots of benefits for your high-end system, including less power consumption and an overall cooler and quieter operation. The standby drain is below 0.1 watts. The decoupled be quiet! Silent Wings 3 135mm fan provides virtually inaudible operation. This is thanks to its unique, airflow-optimized fan blade design along with an advanced fluid-dynamic bearing and 6-pole fan motor for less vibration, super-long life and minimal power consumption. The fan inlet of the Dark Power Pro 11 850W is funnel shaped. This causes an increased throughput of air, which results inhigher cooling performance. Dark Power Pro 11 850W is particularly suitable for overclocking, thanks to its strong and stable 12V-rails. The overclocking key empowers you with full control for overclocking by manual switching between the default four 12V-rail mode and the alternative massive single-rail operation. Dark Power Pro 11 offers 850W of continuous power with four independent 12V-rails for excellent signal stability and nine PCI express connectors for multi-GPU systems. Up to four case fans can be connected to, and regulated by the PSU. The maximum utility afforded by extra-long sleeved cables of up to 120cm and modular cable management simplifies component installation and reduces annoying clutter. This succeeds in increasing the airflow and improving the cooling in even the largest PC cases. Experience the most technologically advanced power supply be quiet! has ever built! Using an advanced full bridge, LLC and Synchronous Rectifier (SR) technology it provides unmatched signal stability and unbeatable power efficiency. It is also equipped with DC-to-DC conversion for tight voltage regulation, even under heavy cross-loading conditions. This ensures reliable operation for the next generation of processors and graphics cards. Only the best components are used in Dark Power Pro 11 850W. That is why we have built exclusively high-quality Japanese capacitors into the PSU chassis. They are rated to 105°C which ensures stability, reliability and a long operating life. You are already using a be quiet! power supply and want to upgrade your system with a new DARK POWER PRO 11 | 850W ? Check here which cables are compatible and don't need to be replaced.